You'll raise your eyebrows and say "Really!" when you learn these food facts. But they'll also help you eat healthier. Do you know your way around a kitchen, supermarket, or mini-fridge? When you're well acquainted with food, you can whip up a healthy meal out of a few ingredients. But if you're mindless about what you feed yourself and your family, you might be missing out on key nutrients and the many ways that food can surprise you. Stash these 10 surprising nutrition tidbits in your food fact files. Did you know that kids copy your food habits? And we're not just talking about table manners. Children pick up on everything, and they're brilliant mimics. Kids see when Mom picks at peas on her plate or when Dad pushes aside pumpkin seeds in favour of potato chips. Studies suggest that kids pick up on parents' fussy food and dieting habits, so be aware of your influence. Did you know that we eat what we see? Put a bowl of candies on your desk within reach, and you'll probably eat more sweets than if the candy were tucked away in a desk drawer or kept in the office kitchen. Thing is, no matter how much candy we eat from the out-of-sight kitchen stash, we tend to estimate that we ate less of it. Did you know that if we put food in a big bowl, we eat more of it – even if it doesn't taste that good? You're at the movies, munching away at fistfuls of so-so popcorn from a mega-sized bucket. In no time, your fingers reach the bottom. And you weren't even that hungry! In one study, people ate much more popcorn when given a larger bucket – even though they rated the popcorn's flavour as "unfavorable"! Same principle applies when we graze at the snack bowls at a party: If a bowl is big, we eat more of the food inside it. 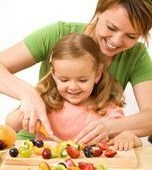 Try this out by setting out a big bowl of fresh-cut veggies when your kids watch television or do homework. Did you know that our moods can affect our taste buds? We've all had emotional eating episodes now and then – a "drowning our sorrows in a tub of ice cream" kind of thing. But a sad mood may actually make us eat larger amounts of bad-for-us foods while a happy-go-lucky outlook turns our taste to healthier fare. Keep this in mind next time you feel your mood swinging. Did you know that food labels can trick our taste buds? We're inclined to believe and be comforted by whatever we see written on a food label. Many people will over-eat foods if they're labelled low-fat, and overeating can negate the benefit of the health claim. Check labels and take note of serving size before over-indulging in what seems like a healthier treat. Did you know that how long you chew some foods affects your appetite? Research suggests that if you chew almonds 25 to 40 times before you swallow them, your body will digest more of the nuts' unsaturated fat, which can leave you feeling fuller than if you'd chewed only 10 times. Chewing your food more thoroughly also gives you time to evaluate your level of hunger as you eat, rather than just wolfing everything down or clearing your plate. Did you know that a cup of cottage cheese can contain nearly as much sodium as 2 hot dogs? Only about 10% of our daily sodium intake comes from table salt. Loads of sodium hides in packaged and prepared foods, like cottage cheese and hot dogs. Check labels to keep your daily sodium intake below 2300 mg. Excess sodium raises our risk of high blood pressure, and high blood pressure is a risk factor for heart disease and stroke. Much of our daily intake comes from packaged and prepared foods, like cottage cheese and smoked meats. Did you know that the way you chop vegetables affects how nutritious they will be? The more finely you chop vegetables, the more surface area you expose to the air. And the more surface area exposed, the more vitamins and minerals can be lost from the food when cooked. Instead, cut vegetables into equally larger chunks for even and nutrient-preserving cooking. Did you know that letting food sit out can boost its nutritional profile? Once you've chopped up certain vegetables – garlic, onions, leeks, collard greens, Brussels sprouts, and cauliflower – wait about 10 minutes before cooking. This time helps to make nutrients more available and less likely to be released in cooking. Did you know that microwaving your veggies may up their antioxidant potential? The microwave doesn't seem like a healthy cooking tool. But some veggies, like carrots and spinach, get an antioxidant boost from a spin around in the super-concentrated and quick heat of a microwave.